PHILADELPHIA -- Lawyers for three families say Ikea is agreeing to pay $50 million because toddlers died when the company’s dressers tipped over on them. The Swedish home furnishings retailer has recalled millions of chests and dressers because of concerns the furniture can tip over when the drawers are opened. In three separate accidents, Curren Collas, Camden Ellis and Ted McGee were crushed to death when the dressers in the popular MALM line toppled on them. 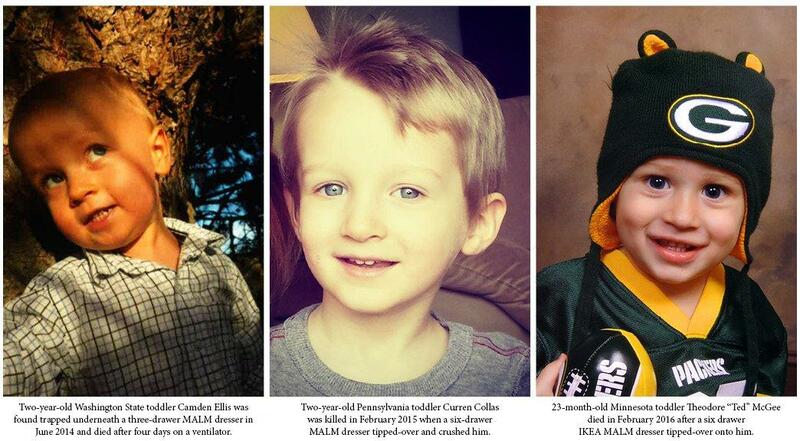 The families’ lawyers say Ikea will also make donations to children’s hospitals. Johanna Iritz, a spokeswoman for Ikea in Sweden, said Thursday “it would be inappropriate to comment,” adding the settlement was pending a U.S. court approval. She referred further questions to its U.S. division. A message seeking comment from Ikea’s U.S. headquarters in Conshohocken, near Philadelphia, wasn’t immediately returned. “When Ted was here we always said what a blessing he was,” said Janet McGee said last summer, the mother of 2-year-old Ted McGee, who died in February 2016, CBS Minneapolis reports. The boy had been napping in his room but awoke and managed to climb up the MALM dresser, when it toppled over and pinned him underneath. By July, the distraught parents were speaking out in hopes it would help save other parents a similar fate. “We really, as parents, don’t want any other parents to go through this kind of hell,” Jeremy McGee said. At the time of Teddy’s death, at least two other toddlers had also been killed, yet IKEA did not issue any safety warnings to consumers. That’s when Sen. Amy Klobuchar pressed IKEA to stop selling the line of MALM furniture and issue refunds or repairs. In June, the Consumer Product Safety Commission issued a recall of 29 million MALM dressers and chests. “The families will never be whole,” said Klobuchar.